Last night was the only night this week when we were able to relax at home after work as a family ... no Scouts, no baseball, no commitments. Lovely! We played outside in the backyard, swinging, sliding, jumping on the trampoline, throwing the football. We cut up cantaloupe and pineapple to go with nuts and macaroni and cheese for supper. 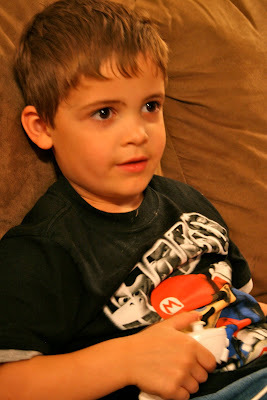 Then we went in the den and watched as the boys played Lego Star Wars on the Wii. It was serious business. As usual, Jakey had a Wii remote with no batteries because he loves to turn the system off with the remote in the middle of the game. The lack of batteries doesn't stop him from "playing," however. Nathaniel was very focused last night. While Nick can be serious about it, last night he was just having a lot of fun. Jakey, as usual, was trying to figure out which character was his. He'll be wondering for a while. Occasionally something happened that cracked Nathaniel up, such as killing Nick's character "on accident." Which is like saying that I ate all those Reese's Cups "on accident." It always makes Nick really mad at first and there's a lot of screaming, but he gets over it pretty quickly. Especially if he can figure out a way to off Nathaniel's character in retaliation, like he did last night. 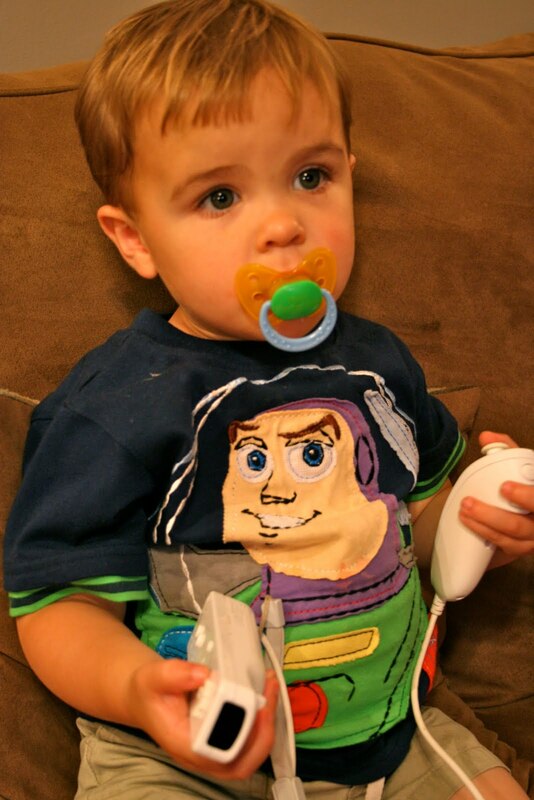 And my sweet baby just sat there and took it all in, swinging his remote and nunchuk around, pushing all the buttons. He was happy just to be included. The whole night reminded me of just a couple of months ago, when our commitments were fewer and our nights were our own. I'm looking forward to having more of that time back in a couple of weeks, but I'm sure I'll also miss the evenings at the ballpark. It's been nice seeing so many of my friends up there, feeling like a real part of the community in which we live ... but in which we don't get to participate very often because of our jobs. I WON'T miss packing up half of our house to go spend six hours down there on a Saturday, especially packing a full lunch and bag full of snacks like we're doing this morning. The last time I took a big bag of food and drinks, Nick sprayed a bunch of apple juice out of his juicebox right onto my camera ... and now the flash won't pop up. So things might be a little blurry around here for a while, until I can get that fixed. Have you ever bought the extended warranty on anything? I never had until I bought this camera. I paid $125 each year for four years for full replacement coverage for this camera, then this year decided that we'd reached the point where it would be more sensible to just take our chances. And then the apple juice happened. Isn't that always the way? I'll probably be back tomorrow with some pictures from the ballpark. I hope we have enough sunlight today that there'll be no need for a flash! I love the fact that the little guy thinks he's playing along with his brothers. Precious! Are those boys related or what?!?! So cute. I especially love the battery-less remote. Genius.